THE lovely hexagon block quilts so popular at present are called by a variety of names and there are many ways of setting the hexagons together, too. 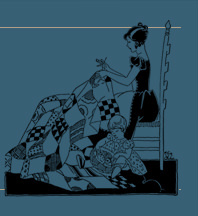 The one illustrated is the plan which we use for our ready-cut quilt, No. 326M, and hundreds of precise hexagons ready-cut means a real labor saving. If you are cutting your own, be careful to have one edge with the weave of the goods and all sides equal. Seams are allowed on the unit hexagon pattern, although this may be larger or smaller to suit, just so the angles are the same and the six sides all equal. We have seen them only an inch across when finished, but a quilt of such small blocks is no temptation to the busy woman. 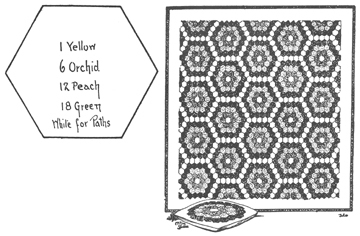 To make one block sew six orchid around 1 yellow center, 12 peach hexagons around this, then 18 green. Straight seams may be run on the machine first, two orchid hexagons together, three groups of three peach, and six groups of three green. Then the other seams which fit in at an angles are best run by hand. A pillow is one such block, appliqued onto white. Setting the hexagons together is most easily done by sewing three white hexagons on opposite ends of blocks which alternate with plain ones into a strip 4 1/2 hexagons long. This will be about 63 inches or the width of the quilt center. Six such strips will finish about 76 inches long. A five-inch border of white all around augments this size to 73x86. Extra green and white hexagons are allowed in our assortment 326M to finish in at the edges as sketched. Colors in this assortment are lemon yellow and peach in solid tints with orchid and green in dainty prints which give a charming effect. These, with white hexagons and a 5-inch white border, may be ordered as No. 326M at $4.00 complete. The pillow, 326X, with plain back is 50 cents. Materials are 80-square which is fine and fast color of course. Yardage Estimate: Allow 1/4 yard yellow, 1 yard orchid, 2 yards peach, 3 yards green, and 3 3/4 yards white.